As of July 24th, 2017 we've received reports of login difficulties and other inconveniences. The following explanations should address these issues and give you a proper workaround. Notification pop-up of an error/update/block. Note: This post aims to provide a brief overview offering insights into the error, workarounds and causes, and can be considered as a starting point for further investigations. If you would like to contribute with additional helping steps, please let us know by sending a private message. Clear your cookies and Cache! Without this, your game will load old data connections which do not work anymore. If you get a notification that you have no Flash version installed, simply click on ok - a popup will appear and you should accept the change (unblock content). 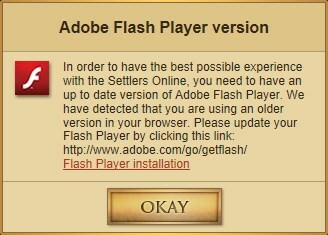 "Allow Flash on your websites" must be activated! You should then save the changes and be able to login again. If the red button is missing, you can click on the grey lock and change the settings/blocking there! It is already known that script blockers can block our game content - as of now, scriptblocker will also block our CDN Akamai. You need to allow this connection and unblock Akamai in order to be able to play the game. Ideally, you should completely deactivate any script blockers (ghostscript/Adblocker, etc. ), as they could block the game connections and intervene with your gaming experience. We have no workaround for steam yet, so the direct connection to the forum will show a white screen. However, you can avoid this issue by clicking on forum in one of our website announcements. Last edited by BB_Saqui; 28.07.17 at 10:40.